At long last I dusted off my proper digital camera, camera phone pics are just not going to cut it anymore on the new blog! 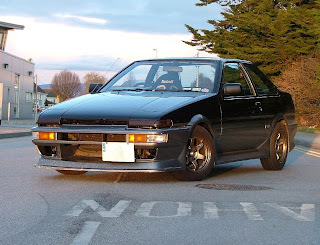 After a nice day cruising around in a freshly detailed Trueno, I found a nice quiet bit of road sitting in the last few minutes of sunset for that almost jdm option style shot..
That Runfree Alpha style front bumper may do a great job of cooling a track hachi (you can nearly see my whole radiator!) but it has definitely seen better days and I am just dying to put the OEM bumper + lip on after it gets sprayed..